Pascin was still a teenager when he decided to leave his parents to study painting and travel the world. His father, who was a powerful representative of the Austrian Emperor and a rich seed merchant, was against his son’s intents. The owner of a brothel in Bucharest triggered his taste for painting. She encouraged him to draw, talked to him about Toulouse-Lautrec and Degas, and advised him to leave for Paris. However, Pascin, who was then still little Pinkas, went to Vienna in 1903. He studied at a painting academy and met George Grosz. In 1904, in Munich, he was in touch with Paul Klee, Wassily Kandinsky, and Alfred Kubin. He worked as a cartoonist for the German humorous and satirical magazine Simplicissimus for five years. With his father’s authorization, he adopted the name Pascin. Following a trip to Berlin, he arrived in Paris on December 24, 1905. He was welcomed by the “Dômiers” (regular customers of Le Dôme café): Rudolf Lévy, Walter Bondy and dealer Henri Bing, who introduced him to Hermine David. The latter was then Jean-Paul Laurens’ student at the Académie Julian and painted miniatures on ivory. 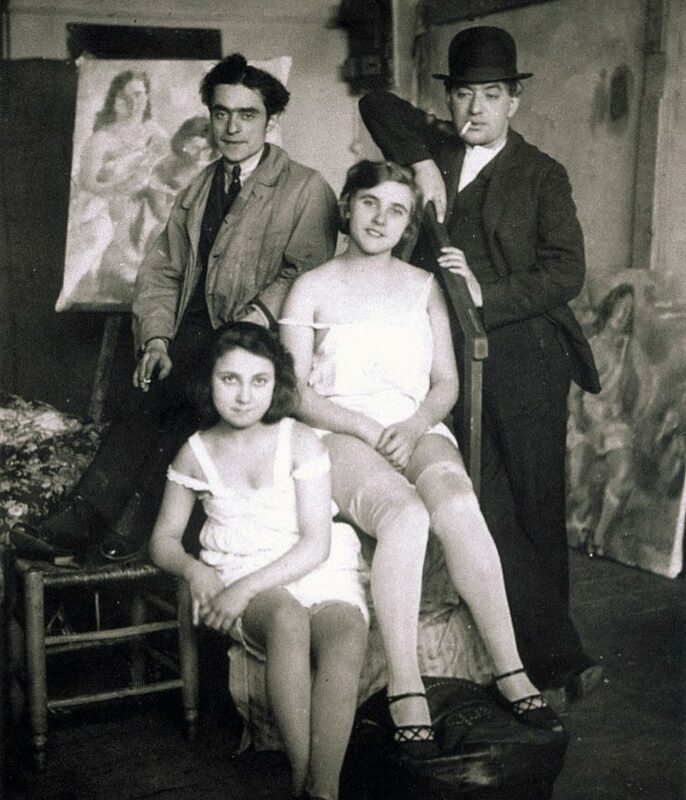 In 1908, Pascin enrolled in the Matisse Academy. He visited the Louvre and took a particular interest in 18th-century painters, such as Watteau, Fragonard, Greuze, and Boucher. In 1910, he met Lucy Vidil who was then a model at the Matisse Academy. He asked her to pose for him in his studio and fell in love with her. Pascin’s income mainly came from his work at the magazine Simplicissimus. He was generous and renowned for the parties he threw, where he invited André Warnod, André Salmon, André Derain, and Kisling. In 1913, dealers discovered Pascin after the latter sent drawings to the Armory Show in New York. This was his first contact with America. As soon as World War I broke out, he stopped working for the German magazine, left his studio to the Kroghs, embarked for the United States and settled in Brooklyn’s Jewish neighborhood. He was welcomed by former Dômiers Max Weber and Maurice Sterne, who introduced him to the New York avantgarde. He brought with him some drawings of nudes, which shocked then-prudish America. He met John Quinn who later became one of his greatest collectors, as well as critic Henry McBride. Hermine joined Pascin in the United States a year later. Every winter, the couple traveled to Charleston, Louisiana, and Cuba, from where Pascin brought back a series of watercolors. Pascin maintained his liaison with Lucy through an uninterrupted correspondence. When he returned to Paris in 1920, Pascin, was then an American citizen and married to Hermine. He met Lucy who had in the meantime married Norwegian painter Per Krogh and given birth to a son Guy. Pascin settled at 3 rue Joseph- Bara, where Kisling and Zborowski were already living. People recognized him as he always wore a bowler hat. On the road from Montparnasse to Montmartre, he often stopped at La Belle Poule, his favorite brothel in rue Blondel. He threw numerous parties and made the most of Parisian nightlife, together with Francis Carco, his Bulgarian friend Georges Papazoff, Pierre Mac Orlan, André Salmon, Paul Morand, Foujita, and the famous Kiki. Man Ray introduced him to Max Ernst, with whom he often talked late into the night. One night, Pascin met Soutine at Le Select bar. Youki Desnos wrote about this event in his book Confidences: “We all drank a good dozen of whiskies. Despite the good atmosphere that it had led to, the two artists did not bridge the gap between them […].While leaving, Soutine told Pascin: ‘Do not assume that I dislike your paintings. Your little women really turn me on.’ ‘I forbid you from getting turned on in front of my women, sir,’ answered Pascin, furious. Then he added: ‘I’m the son of God. Shame on those who dislike me.’ Soutine was of Slavic origin, hence superstitious. He ran to Pascin, shook his hands: ‘but I like you a lot Pascin, believe it, I like you a lot.’ And he disappeared in the dark of the night.” Between 1921 and 1922, Pascin left Hermine and moved into 36 boulevard de Clichy. They maintained friendly and fraternal relations. Pascin was a sensitive and sensual man, just like his painting. Throughout his life, he painted women, such as Kiki, Aicha, Jacqueline Godard, Zniah Pichard, the Perlmutter sisters, and Julie Luce. Regularly, Hermine David, Lucy, Per Krogh, their son Guy, and the group of models that Pascin called “les petites crevées” met up for picnics. Between 1920 and 1930, Pascin, who loved to travel, visited North Africa, several European countries, and the United States. In 1924, he visi ted Tunisia with painter Abdul Wahab. In 1926, he planned to settle in Palestine but he changed his mind while he was in Cairo and returned to Paris via Tunisia. He brought back with him numerous drawings. In 1924, the Loeb brothers set up an exhibition of Pascin’s work for the opening of their gallery. The catalogue was prefaced by Pierre Mac Orlan. 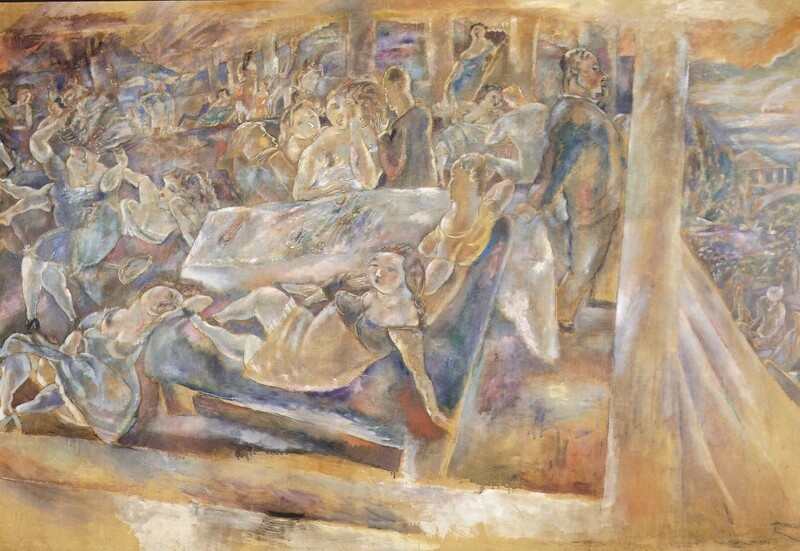 Some time later, on the occasion of a banquet organized in André Warnod’s honor, Pascin got into an argument with Galtier-Boissiere, director of the magazine Crapouillot. Following their argument, Galtier- Boissiere wrote in his paper: “Let Mr Pascin pack his bags and return to Bulgaria. We will be deprived of his lovely drawings but we will be easily comforted.” In 1927, Pascin returned to New York to arrange his business affairs. Lucy met him there. From 1927 to 1930, Pascin was depressive and drank more and more. 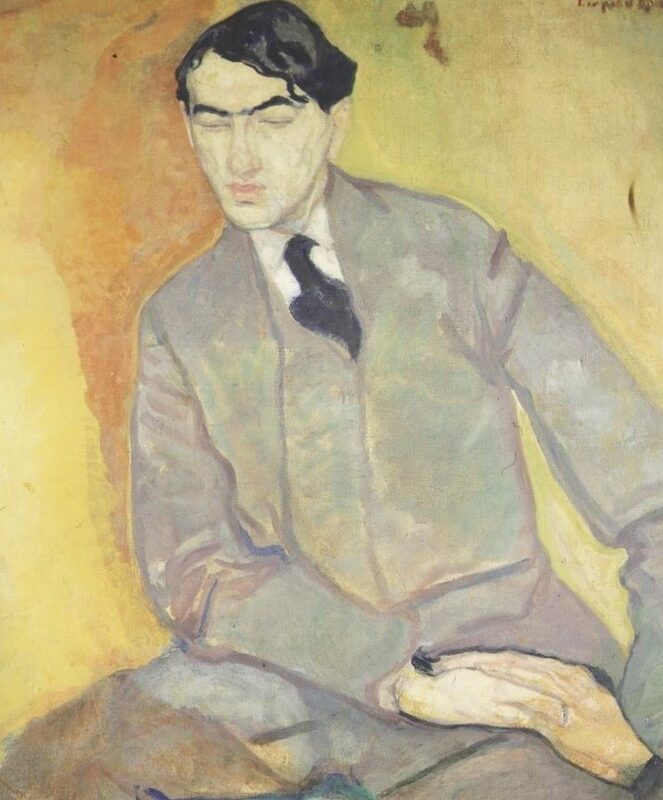 In 1927, Flechtheim organized an exhibition in Düsseldorf and commissioned his portrait by Pascin. At that same time, he signed a contract with the Bernheim- Jeune gallery that forced him to paint “pearly” nudes. Pascin never stopped loving Lucy. Their love story ended tragically on June 2, 1930. Pascin committed suicide in his studio. He slashed his wrists and wrote “Goodbye Lucy” with his blood on the door. He hung himself after writing a will in which he bequeathed his estate to Lucy and Hermine. On June 7, 1930, the galleries in Paris closed as a sign of mourning. Over a thousand persons followed the cortege to the Montparnasse cemetery. The rabbi said prayers and repeated several times “may his eyes rest in peace.” Following his death, Hermine and Lucy supported each other in their grief and remained closely tied.